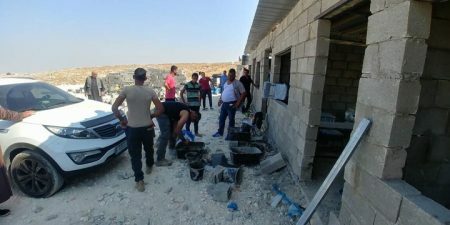 The Wall and Settlement Resistance Committee in the Palestinian Authority, in cooperation with activists and parents restored the construction of the Jeb Al-Theeb School east of Bethlehem, which was demolished by the Israeli occupation on the 23rd of last month. Assaf told the press that five rooms were rebuilt in brick and metal added to the roof in the presence of the head of the resistance wall and settlement Walid Assaf. He added that large numbers of Israeli soldiers tried to prevent them from rebuilding the school by force, but the activists and the people insisted on rebuilding them despite the harassment of the occupation. The director of education ministry in Bethlehem Sami Marwa, stressed that the reconstruction of the school confirms the resistance of the Palestinians people and their constant pursue to their rights and their continued in the struggle to defeat the occupation. Saturday afternoon number of Israeli occupation soldiers gathered on a hill overlooking the school that has been rebuilt. Abu Hussein said that the people of Jeb al-Theeb expressed their fears that the Israeli occupation authorities will re-demolish the school, which has been rebuilt today. Abu Hussein called upon our people to gather in the vicinity of the school to resist any occupation forces attempt to demolish what has been built today. He also called on the media and journalists to cover Israeli occupation attacks against our Palestinian . For his part, Mohamed Abdel Nabi Laham, a member of the Fatah Revolutionary Council, said that the presence of the occupation forces and their attempt to besiege the village of Jeb al-Theeb will not frighten the volunteers who came to rebuild the school. He added that the presence of volunteers since dawn today carries a great address ther will, challenge and steadfastness. The Jeb Al-Theeb School was established to serve students from grades 1 through 4 and accommodates 64 students.